We accept a wide variety of ferrous and non-ferrous metal. From aluminum to copper, automobiles to cast iron, Alco Iron & Metal will provide the cost competitive quotes FREE of charge. Two large warehouses provide our customers with with a variety of ferrous and non-ferrous structural shapes, both new and surplus. We are a qualified provider of customized welding projects, specializing in steel fabricated items. Licensed and experienced, you won’t find a better demolition contractor to handle your project. Our experts are prepared to dismantle such as water tanks, power and water plants, and many other large industrial structures. To obtain a FREE Quote for our services, call or email the nearest location. Alco Iron & Metal Co., will disassemble and remove your transformers for your site, prepare them to be recycled efficiently and safely following all federal, state and local regulations. Alco Iron & Metal Co. has earned our reputation. We cater to customers large and small. Our service centers have grown to be a one-stop shop for all your metal needs. Since our doors first opened, we’ve always strived to be the best. We want to make your metal services as simple as possible. Our family has selected a team of the most knowledgeable professionals in the industry. We ensure that you’ll receive the best prices on any product bought or sold and only the highest quality metals walk out our doors. Easily accessible from five locations, 35 acres of collection space, and containers placed on location. 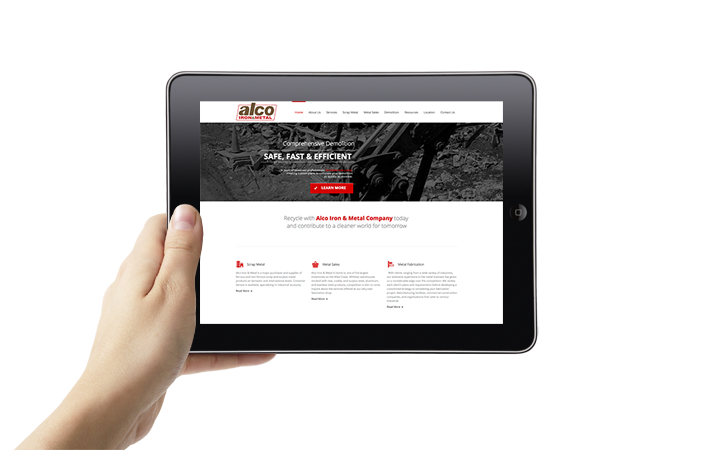 Alco Iron & Metal has embodied the best qualities of a full service metal company and maximized the services we offer. We receive metal shipments from a number of domestic and international sources and treat all of our clients to a FREE competitive quote. Your satisfaction is our primary objective. We carefully sort and inspect all of our metals and only use the latest technology to handle recycling and fabrication. If you have any questions about the process or wish to learn more about the ways we can help you, don’t hesitate to contact one of our specialists.